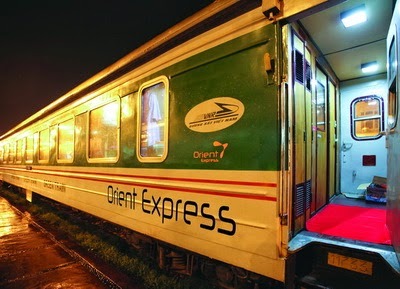 Vietnam Rail operates some of the cars, but other cars in the train are operated by private companies (Tulico, Ratraco, Fansipan, Orient Express, Friendly and Victoria Hotels, and many others). Some of these cars are significantly nicer than the standard cars. They cost approximately US$45 (July 2013) for a soft sleeper berth. You may need to arrange with a travel agency to get tickets on these tourist cars, but any traveller can purchase tickets for the VNR cars at the Hanoi train station. Warning: several of these cars are not significantly better than standard Vietnamese sleeping cars though, and still substantially more expensive. 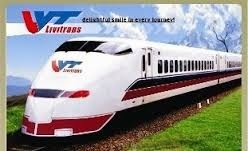 Pumpkin second class is actually a VNR car booked via this company. Even Pumpkin first class only has a squat toilet (although a sign above the toilet door says: "western style toilet"!). Trains between Hanoi and Lao Cai are designated by SE-single-digit-suffix. SE-1 and SE-3 are from Hanoi to Lao Cai while SE-2 and SE-4 are back. Each car belongs to each company, joined by single dragging engine head. So whether you book Tulico or OE or else, you depart and arrive at the same time as the other. Prices vary according to both the type of seat purchased and the season during which you are travelling. The times around Vietnamese holidays are particularly expensive and tickets cannot be assumed available for same day travel, so book ahead if possible. Travellers are highly recommended to purchase a berth in a soft or hard sleeper car, though the trip in soft seat class is not intolerable. For a bed, expect to pay in the area of 430,000-525,000 dong (one-way). For a soft seat, expect to pay 220,000 dong for one-way (May 2012). There is usually a dining car serving good, surprisingly affordable noodles (10,000 dong) and rice porridge (10,000 dong), but it's always wise to bring your own snacks and drinks as well.Cheaper tickets, especially in hard sleeper class, can be hard to come by at times, as tour companies and travel agents will snap up these to first on their own customers (too frequently a promised soft sleeper berth will turn into a hard sleeper when it comes time to board). To avoid rip offs better go to the train station by yourself and get the ticket from the ticket office. This is the only way to make sure that you will get what you have paid for. Travel Agencies in Vietnam are known for their bad business practice. Although one cannot be assured of finding a place, it is often possible to arrive at the station a short while before boarding time, as there are usually young men hanging around trying to hawk unfilled berths at the last minute. The price of these tickets will fall dramatically as departure time draws near. If you are backpacker, buy instant noodle cup ($1) with you. There's free hot (boiling!) and cold water at the entrance gate of each car. Left value is usally hot, right cold. "BEWARE" if you are first user. On the hot value, the cold water will come for 20-30 seconds before the boiling flows out and cooks your hand! If you have very rigid travel dates, are travelling on a public holiday, or can't be bothered to head down to the train station before your train you can book tickets online before you come to Vietnam. Tickets to LaoCai/Sapa can be booked at the fansipan website. booking tickets online usually costs up to 25% extra, but they will pick you up from your hotel in Hanoi for free. NOTE: If you have a prebooked ticket from Lao Cai to Hanoi with Fansipan, you have to pick up your ticket from the small and hard to find Fansipan travel office. To find the office stand directly in front of the Lao Cai station, then head directly left. You should see a small sign just past the end of the station building. The train ends at Lao Cai. From there, dozens of shuttle buses will be waiting outside the station to take you the remaining distance to Sapa, usually at a 'fixed' rate of 50-60,000 dong or US$2.50-$3 (July 2013) or US$25 for a private case. It's often possible to bargain down to a lower price, depending on demand. The ride is about an hour of beautiful views (if the weather is good, it may be an hour of fog at other times) more than 1000 meters up into the mountains. Note (Sept 2012) this road is prone to landslides, one of which recently caused a delay of a few hours. Note (Dec 2013) Problem gone. You may want to book a return ticket when you buy your outward journey, as picking up tickets in Lao Cai is harder than in Hanoi. Ticket counter at the train station is open 8 to 10 am and from 2 pm. The staff do not speak as much English, and they possibly only sell tickets for travel on the same day so sleepers may already be sold out unless you go first thing in the morning. Pay attention to the time of your return train. Trains leaving Lao Cai around 20h00 will arrive in Hanoi at around 5h00 early in the morning. However, the train "always" late for 1-2 hours. So it's better to have some instant noodle cup in your personal sack. If you go back to Hanoi by Sunday night, be prepared. The train is usally full. So, "some" company's operator who guard the entrance of it company's car may allow illegal people to board your car. They will sleep along the passage, in front of the restroom or else. For lonely lady traveller : be warned. 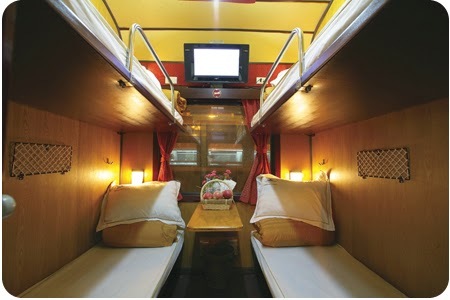 Each sleeping car has room (cabin) which accomodates 4 or 6 people per cabin. The cabin heavy door has a lock "from inside". When locked, the door reduces noise markedly. If you're not sure, better ask for upper bunk. Eventhough less comfort than the lower, it gives you more secure on top of your personal defensive gear. Plus, there's less smell from the feet of the your cabin's partner(s). If you don't make prior arrangements to return at an early hour, you may find yourself sitting outside of your hotel, waiting for the desk to open. If this happened, ask your taxi to bring you to Hoan Kiem Lake instead of your hotel and use the spare time to watch early morining activity. The south-west bank of the Lake will give you the stunning Sunrise view over the lake's Pagoda. BTW, the famous Den Ngoc Son temple is at North East bank. The coffee shop will open around 06:00am. Have your breakfast there while looking and the warm and lovely sunrise. If you don't like morning walk-around, ask your taxi to land at the north-west around City View cafe. Walk across the road to the north bank with your luggages. Then you can walk along Hang Dao road (west) or Hang Be road (east) until Hang Bac to see activities of vendors-on-bicycle.